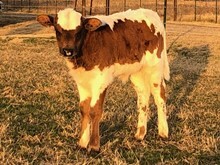 A great young cow with JR Grand Slam, the Shadow, and Emperor genetics to build on. Beautiful horn growth and set to be one of our foundation cows. She currently has a unnamed bull calf at side out of Black Kettle. Many thanks to Lonesome Pines for the invaluable help in getting our program off the ground and the enormous amount of time and information provided.